Spot silver reacted in much the same was a the spot gold price yesterday, ending the silver trading session with a wide spread up bar, which closed well above the 9 day moving average once again, and validating the hammer candle of Monday which I suggested would be the case in my spot silver market report yesterday. The key technical level of course remains the previous high of last week in the $17.50 region, and in addition, and as outlined previously, spot silver now has a deep band of consolidation to break through if the current bullish momentum is to be maintained, and for any sustained move higher, much will now depend on the performance of gold, along with the equity markets and the US dollar. 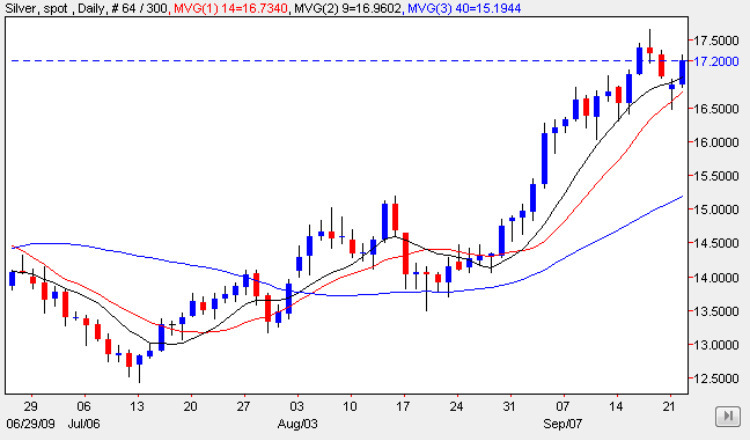 Technically the silver chart remains bullish, with all three moving averages pointing sharply higher and there is no reason to suggest that this sentiment is likely to be halted or reversed by the silver bears. However the fact remains that the resistance outlined above could provide a substantial barrier to further moves higher, but should today’s FOMC statement provide little in the way of surprises or shocks to the market, then this may be the catalyst to see spot silver penetrate this stubborn area and continue the upwards push towards a break above the upper level at $18 56 per ounce. The short term trend fo spot silver is bullish, the medium term is sideways and the long term is bullish.